Something I need to speak about is feeling uninspired. It started off with bloggers block when I just really weren't in the mood to blog. I didn't want to write and blogging felt like a chore, even though I wanted to do it? I hope that makes sense. I was just going through a mood where I didn't want to do anything but I didn't want to stop either. Well I got through bloggers block, I had my break and I came back feeling more motivated than ever before. I started with creating a studygram as that is something I have always wanted to do, but at the time I always wanted to do one on tumblr, but instead I've created it on Instagram; you can follow me here. I then went to a bloggers event which was absolutely incredible, I really enjoyed it and I'm now going to another two (bloggers ball and bloggers suite). My motivation carried on into another instagram account where I wanted to share my nail designs with you and my passion for painting my nails. It's something I never go without and I wanted to embrace it but I didn't know how too. You can follow that account here. 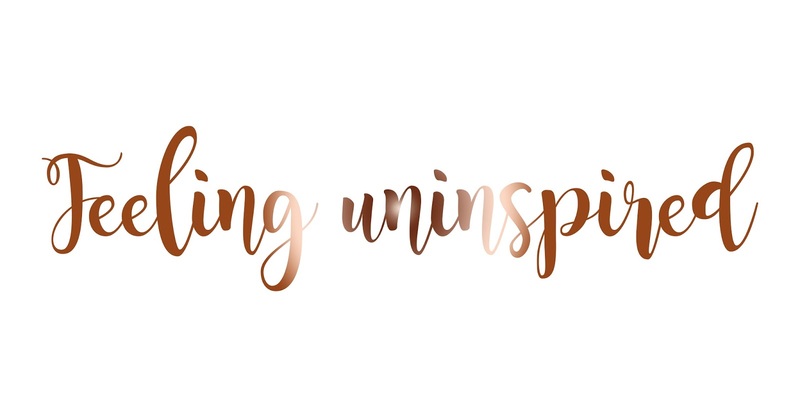 Unfortunately I'm not feeling uninspired. But I'm not just feeling uninspired with my blog, but with everything. I don't want to do anything. I've been meaning to research ideas for my dissertation and I just really don't want to, I don't feel inspired to. It's as if I'm trying to find something that I'm missing? Something feels like it isn't here and that's why I'm feeling uninspired but I'm not entirely sure what that something is but it's making me struggle with absolutely everything. I want to play Sims 4, but at the same time I don't want too and it's the exact same situation with working out too. I desperately want to start working out again but I feel rubbish and unmotivated/uninspired to do it which is making me feel even worse. I've been through situations like this before however I cannot remember how the heck I got through them. What do you do when you're feeling completely uninspired about absolutely everything that's in your life? Or when you're feeling 100% rubbish about everything including reading a book? Something I really do not want to do is stop doing everything until I'm feeling inspired again but I also currently do not have a clue. If you've ever gone through a phase of feeling uninspired about your life and everything in it but you managed to get through it in a quick and short time frame, I would absolutely love it if you could give me some tips on how you managed it. So right now I'm trying to do the things which I love the most which might make me feel inspired again. I have even started playing Pokemon Go again to get me out of my house and going to different areas to catch Pokemon and put me in a better mood. I hope you have a lovely Monday filled with a heck load of motivation and inspiration!